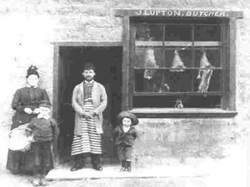 John Lupton was a butcher in Burley for 40 years. His shop was on Main Street next to the Queen‘s Head. He kept a diary after he retired in 1900 and some of it has survived. From the fragments we can piece together a picture of life in Burley 100 years ago. Born in 1840 at the Queen‘s Head, John was married in 1866 at Burley Parish Church to Eliza Lister and died in 1915. There was no pension when he retired and his entries suggest that he lived off savings, invested in property and shares. He owned some cottages in Burley and Otley, and had regular income from shares held in various railways and a brewery as well as receiving 6s/3d (about 31p) per quarter from having Wm. Fison‘s advertisement board in his front garden at Brumfitt Villas on Main Street. He was comfortably off, but not wealthy. Being much involved in the work of the Church, he was the Parish Clerk. He supported the Conservative Unionist Party, and read the Yorkshire Post. Gardening was not only a hobby, it was also a very important contribution to the household economy of his family. He looked after the garden at Brumfitt Villas as well as that of his daughter Ann on Pleasant Row. Flowers like cornflowers, pansies, candytuft, asters, stocks, sweet williams, wallflowers and antirrhinums (which he wrote as “anterinas”) are mentioned. His vegetables came from an allotment on Sun Lane, for which he paid a rent of £12 per year in instalments. During the week ending Friday 15th August 1902 he picked 47 pounds of peas and 14 pounds of beans. In the last week of that month, he gathered another 44 pounds of peas, and took some on a holiday to Morecambe. He was still picking peas right through to the middle of October and harvested barrow-loads of potatoes. Sprouts lasted into March, and he wintered cauliflowers, cabbage and lettuce in cold frames. Needless to say, he suffered from all the usual gardening problems including snails, late frosts, hungry birds and droughts. He and his wife had a regular holiday, usually between the end of August and the middle of September. For instance, their Morecambe holiday began on 13th September 1902. The return fare on the train was 6s/6d (32½p). They left Burley on a direct train at 7.40 a.m. arriving at 10.20 a.m. They took apartments (meaning they rented rooms, supplied their own food, like the vegetables John had grown, and had meals prepared by the landlady) and spent the days visiting Heysham, the Winter Gardens, the pier, the Bare end, or Lancaster. In those days, there was an electric railway between Morecambe and Lancaster. They went to church twice on both of the Sundays that they were there. The weather sounds to have been rather cold and wet! Railways were very much part of his life. He travelled on them and held shares in several railway companies. On June 7th 1900 he “went by the 10.20 a.m. train to Skipton and from there by waggonette to Grassington, to see Walter Morrison M.P. cut the first sod of the Yorkshire Dales railway. I had an invitation card sent by the Directors. There was a band and grand procession. Set off walking back at 3 o‘clock by Linton and Burnsall to Bolton station, but got a ride from Linton to Barden and from there to Bolton Abbey”. He often walked long distances, so the prospect of walking from Grassington to the station at Bolton Abbey did not daunt him. As Parish Clerk he had to prepare registers for baptisms, marriages and funerals. He notes that the Christmas holiday was popular for weddings (possibly because there were few holidays for mill workers and it would be a time when friends and relatives would be able to be together). In 1900 there was a wedding on December 24th, one on 25th and two on 26th. He would attend church himself twice on most Sundays, and three times on major festivals. He was also prominent at church social activities, and, being a butcher, he was expected to cut up the ham for the high teas. These were very popular, especially around Christmas, when sometimes 160 to 180 parishioners would sit down for a meal. Whether being a butcher led him to adopt a high meat diet we don‘t know, but he was certainly used to buying a large amount of meat each weekend and more in the week. On one weekend in October 1902, he bought a crop of beef, which weighed 19¼lbs. It cost 8s/2d. (41p). He gave about half to his daughter who had nine children, but had the rest at home, no doubt in expectation of visiting relatives and friends. He bought 5lbs of veal early the following week. Burley was a more compact village in those days, most people working at Fison‘s mill. His was a world that we have now lost, but how fascinating it is to have the glimpses from John Lupton‘s diary.